I get one of my kids start back at the mast bob and lift it a bit as he walks forward (it's not very heavy from that end). Standing near the back of the boat, I lift it the rest of the way while he runs around and cranks on the trailer winch. I used the Mast Stepper III over the holiday and am very pleased with it. It definately takes time to use but if your concern is eliminating the heavy lifting it is worth getting. You can speed things up by skipping the lines that keep the mast from moving side-to-side and just using the jin pole to lift and lower the mast. You have to hold the mast as it's going up or down to keep it from going sideways, but that takes no where near the effort of lifting the mast. I'm very happy with it. I remember watching an old video of mast-stepping on a H-21. The mainsheet blocks were used instead of a winch. With "baby stays"(?) in place and the mast resting on top of an ice chest on the aft end of the tramp, and a gin pole secured, grabbing the mainsheet and "walking away from the boat" brought up the mast quite smoothly. Could this be an option for the Getaway? When I had a Hobie 17, I made a gin pole from a 2x4 and tied the trapeze wires to the wings to provide side to side stability; you do need to have some way to keep it stable until you get the mast high enough for the shrouds to prevent it swaying. I managed to find the maker / vendor, and spoke directly with them. The owner never returned my multiple calls -- he too has no concept of "making it right" for the ultimate customer. So, does anyone want a Stepper with a bent part? Worst case of customer non-service that I have encountered. Experienced monohull sailer, new to Hobies. I chose a Getaway to get started. Sailing in Northern Calif. I approached Matt at Hobie with request for resolution, but he wimped out, saying "we just buy it from a vendor, and re-sell it"
I am certain I never have spoken or emailed you about an issue with a Mast Stepper III . I designed the Mast Stepper for the Sport Cruiser and the Stepper III (Specifically for the Getaway) and would not say... we simply buy and re-sell that part. We would stand behind these 100%. So, if you actually contacted the "Vendor"... You would have to be referring to the original "Mast Stepper" and in that case... correct... we have/had no control over that product. It was not our product and the original guy who designed it... sold his business. The guys who picked it up were simply machinists. We no longer carry the original Mast Stepper I "EZ Step" (since 2010). I have used all of these systems myself. They may take a bit to set up, but are very easy once you understand them. There is a huge amount of leverage involved, if you bent a part in one of these systems... you have done something incorrectly. And... though we are excellent with support, customer service and warranty... we are not Walmart. We do expect some amount of personal responsibility from our customers. I used trapeze wires to stabilize the mast swing. The main sheet was made VERY long for this purpose. I wouldn't want my main sheet that long on the Getaway when sailing. Would have to have enough purchase for power and length to get the mast all the way up. We just don't have parts for these things... we simply purchase complete assemblies. I can only assume a failure to keep the mast rotated has damaged the part in question. We don't see many issues with them. The guy bought this company from the people who started EZ-Step as a product, so he is not savy on the product... just builds them and builds in batches, so doesn't stock spares. Can you photo the part needed or indicate on the instructions what it is? Maybe we have a damaged unit we can scavenge parts from. I have the mast stepper III, and I like it a lot. I found it easier to pin the gin pole to the foot, then put the foot on the mast and use an aftermarket bungee cord to hold the foot to the mast. One reason for this is the bungee loop that came with my stepper is too long; I have to wrap it around the stub sticking up from the foot twice, and then it's really hard to get the gin pole on the stub and pin it. Can I send the bungee loop in for replacement with a shorter one that fits my Getaway? The loop I have must be for a boat with a wider mast. Who should I contact? Also, I have trouble getting the shackle pin in the shackle connecting the gin pole to the furler roller-my fat fingers don't fit in well under the roller. So I bought a 4" long 1/4-28 grade 8 bolt to use instead of the shackle pin. I can spin it more easily since it sticks way out past the furler roller. I also use stainless steel spring links instead of shackles at the loops by the wing bases to speed things up a bit. I have the same problem with my bungee cord...too long. I would like to get mine replaced too. Other than that I love the mast stepper III. Have your dealer(s) contact our warranty department... they can send you replacements and note if there is an issue with assembly of the kit here. There is just one length bungee. 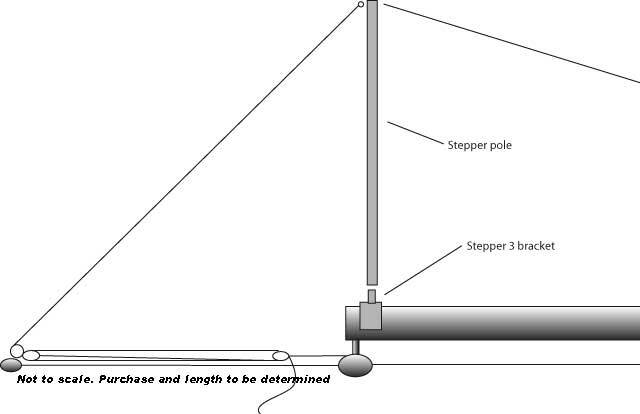 I have a question: for those of you using the Mast Stepper III in order to step the mast by yourself (on a trailer), what do you do once you pin the mast (in the down position, before you step it up) and half of the mast if hanging over the back of the boat? In the directions, they don't show you how this is handled. My mast looks like it's really bending at an odd angle, with the weight of the mast bob and hardware weighing it down off the back of the boat. It can't be good for it. Fortunately, the one time I did this, my wife was able to run back and hold it up. But if I sail alone and there's nobody around to hold up the top of the mast while I rig the rest of mast stepper system, it just looks like it will be really bad for the mast, especially since the comptip looks so fragile as it is. The mast and CompTip experienced MUCH higher loads when sailing and capsizing. Not an issue when stepping, but I certainly suggest a pad at the rear beam at minimum. I purchased a mast stepper III for my Getaway and I have to say I noticed immediately that it was pretty cheaply manufactured. I used it a couple of times with scepticism. It worked well enough but you could see the strain where it attaches to the mast. This morning mine broke, the aluminum weld began to tear. Fortunately, I was paying close attention and was able to lower it before the weld completely failed, no damage done. I would recommend anyone purchase one of these things. Lucky for me I'm a Welder by trade so I will be building one that lasts and that will be safe to use. Let's see some pics of the damaged mast stepper.